My maternal grandfather, Leonard C. Harbison, was a wanderer all of his life. When I was young, he and my grandmother, Eula McCarn Harbison, lived in Fairfield Highlands in the western suburbs of Birmingham. From their house, you could see the Fairfield Works of U.S. Steel and the Ensley Works in the distance. When Grandmother would hang clothes on the line to dry, she’d walk up and down the line with a damp rag to clean off the industrial soot. Even though it was bad for pollution, I loved to watch the robust factory activities, the trains coming and going, the smoke rising into the sky, and the orange glow when molten steel was poured at night. Their street dead-ended at land that belonged to Woodward Iron and Granddaddy loved to take a walking stick, a dog, and a grandson on hikes along the creek in the wooded property. He had five grandsons in all and when one outgrew the walks, there would be another to fill in. When my brother was very young and I was a teen, I heard Granddaddy tell Grandmother “I like them when they’re that age. When they get older, I don’t have much use for them.” It wasn’t personal; he always had a sense of wonder and a love for nature and animals and he found that the younger boys would tend to get more excited about sharing it with him. The federal interstate system eventually claimed the Fairfield Highlands house for right of way for I-20/59 but if you know where to look from the interstate — near the Allison-Bonnett Parkway / Jaybird Road exit – you can still spot a large oak tree that was in the backyard of that house. I used to climb that tree. When the interstate moved in, my grandparents moved closer into Birmingham in the Central Park neighborhood. There was less space for nature walks but Granddaddy still would take a stick and a dog and walk the alleys of the neighborhood and sometimes over to the nearby Bessemer Super Highway to go to the pharmacy, to the grocery store, or to get a haircut. Mother recently rediscovered a newspaper article about Granddaddy Harbison that was published in The Cullman (AL) Times in 1997, four months before he died. Under the headline “One Roaring Twenties Train Ride Was Enough for Young Hobo,” the article profiles some of Granddad’s adventures when he was a young man. Some of the time lines seem a bit skewed but he was recounting memories from seventy and more years earlier and small inaccuracies are to be expected. Granddaddy grew up on his parents’ 500-acre farm in Trade, Alabama, in Cullman County. Charlie and Mary Lott Harbison farmed and raised livestock and Leonard, the second youngest of fifteen children, recounts idyllic days on the farm and hanging out at Luther Perdue’s general store. He talks about hopping trains and “hoboing” – a popular activity for many young men (and some women) during that time. Woody Guthrie is perhaps the most famous proponent of that lifestyle. I was surprised to read that Granddaddy’s total “hobo” history consisted of one short trip from Cullman to Birmingham and back. He says that he met up with a “Yankee hobo” in Cullman and rode on top of the train, ducking for tunnels and overpasses. By the time he got to Birmingham, he had seen enough of the world and was ready to turn around and go home. But his wanderlust continued and soon after his hobo adventure he moved to Akron, Ohio, working in the Firestone tire factory. After returning to Alabama from Akron comes the most intriguing part of the travel lore. Leonard, along with a brother, cousin, and friend, hopped in a Dodge and headed out west. I know he spent time in Oklahoma, Oregon, and California and he often mentioned Tom Mix and those Hollywood studio lots. Why don’t we think to listen more when we’re young? I would love to hear more about the western travels – and especially about the movie lots – but at the time it just seemed like listening to somebody talking about the “olden days,” as we referred to them. My students now tend to say “back in the day” if I start to reminisce. My grandfather loved all animals and he loved to hunt. He always had hunting dogs in a pen in the backyard of his Fairfield Highlands house. He was one of those southern hunters who was not that interested in the kill but in the “chase.” In fact, I’m not sure he carried a gun on his hunting trips. Instead, he and his hunting buddies would stay up all night drinking coffee by a camp fire and listen to the dogs run; they recognized the individual barks of the hounds and would listen to the chase until dawn. If the barking got too distant, they’d pick up and move to another location and listen. His love of hunting is mentioned in that newspaper article as well as the fact that he met my grandmother at Ryan’s Creek Baptist Church after an all-night hunt with Rev. Charlie Johnson, the Ryan’s Creek preacher. He and my grandmother are laid to rest at the Ryan’s Creek cemetery, across the road from the church where they met. Leonard and Eula married and had three children; they farmed in Cullman County and eventually moved to Birmingham in the ‘40s for Granddad to take a factory job until he retired in 1968. They maintained land in Cullman County and frequently went up for weekends during retirement. Granddaddy would go out into the woods and wander on those trips; he never tired of nature. At first glance, it doesn’t seem that I have a lot in common with my Grandfather Harbison. But I love to take walks in the woods. I inherited his love for plants and my house is filled with houseplants now that will be moved to the yard as soon as the weather gets reliably warm. In fact, I still use some of his containers for my plants. I inherited his affection for “volunteers,” those plants that just pop up in the pots or in the yard. This has been an extraordinarily mild winter and I already have volunteers all over the yard. I don’t like to weed them out; they chose to grow there so I choose to let them. I’ll make the final decision in the spring when I see what my volunteers plan to do. And I inherited his wanderlust, although I’m afraid my travels cannot compete with the style and romance of Granddaddy Harbison’s. 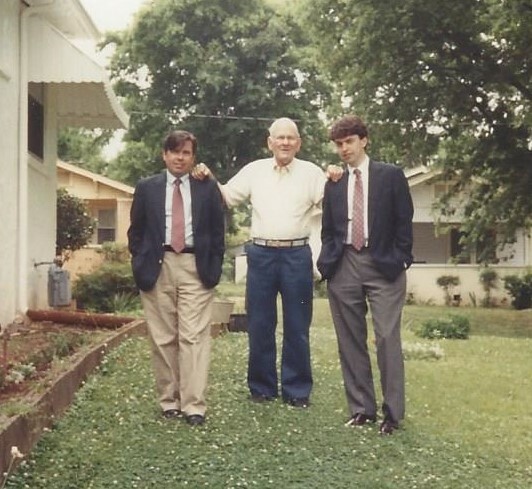 Note: The photograph is of my Grandfather Harbison (C), my brother (R), and me (L), taken at his and Grandmother’s Central Park home in 1988. This entry was posted in Leonard C. Harbison and tagged Alabama hobo, Cullman Times newspaper, Eula McCarn Harbison, Leonard C. Harbison, Ryan's Creek Baptist Church, southern hunting, Tom Mix, Woodward Iron on February 24, 2017 by gedwardjourney.